For vintage motorcycles, proving grounds are very valuable following a resuscitation or a full-on restoration, or just some new parts. If you have read the Concentric Circles post, then you are already familiar with my regimen for progressively testing a vintage vehicle's roadworthiness. In this instance, I'd like to relate an actual ride to an event at the end of that process. Twas the night before the event, and the 6V battery for the BMW R50 is on the floor on the charger. The float chambers for the Bing carbs are also on a cloth on the floor awaiting the installation of new gaskets. They were next to the new plugs which I was installing. The headlight is out of its' bucket as I try to discover why the neutral light will not illuminate despite a new bulb, and seemingly solid wiring. The tail bag from another bike that I plan to attach just looks wrong with the straps and connectors looping around all over the place. It is getting late, and I need an early start to make it the 35 miles to the start of the event. That distance will roughly equal the longest single journey to date for the bike. And then there is the event itself. A fifty mile loop of backroads. And then there is the ride home of another 35 miles. I was breaking my own rules of concentric circles and rolling the dice, but what could I do, the event was here. I put the headlight back together still with no neutral light, and reattached the float bowls. I opened the petcock and let them get some gas. No leaks after 5 minutes, so a big improvement. I installed the plugs and removed the tail bag, opting for the magnetic tankbag I seldom use. I unthinkingly rested it on the now vacated fender rack and the magnets grabbed on like my son did on his first visit to the dentist !! This thing was going nowhere, and fit the rack nicely. Sorted. I left the battery on the trickle charger and went to bed. brooksmotorworks.comSunday promised to be a beautiful but chilly day. Highs in the low 60s. Back in the chilly garage, I installed the battery, threw the standard toolkit in the tank-tail bag, and suited up. I opted for the jacket with liner and the fullface helmet, which turned out to be a very wise choice. Now there is a certain twinge of apprehension whenever you are about to start a vintage motorcycle for the first time after doing some work. Particularly one which you can only kickstart. The R50 normally starts on the first or second kick following the appropriate pre-starting sequence, prayers, and a ritual offering of virgin octane boost. After the second kick, if it does not start, the next 20 kicks are useless, you just need to let it sit for a few minutes and then try again. My former Norton 750 was the opposite as it would sputter convincingly on the first 73 kicks, and start only when it could verify that you were going into cardiac arrest. First kick, nothing. I did some light stretching and rolled my head around like a boxer before the bout to loosen the neck muscles. Second kick, nothing. Not even a sputter. I slowly turned to grab a seat, but then quickly spun around and surprised the bike by quickly giving it a third kick unexpectedly. It fired right up into a delightfully even idle pulsating through the twin peashooters. Ya gotta know your machine. Now I know what you are thinking. This is an ominous beginning, and perhaps discretion should be the better part of valour. However, discretion is rarely a part of owning vintage iron, and I never liked velour because it wears poorly and reminds me of a pimpmobile. I ventured off into the emerging daylight, which was a good thing because the headlight has the same number of lumens as an aging firefly. The bike loved the cold air, and it was running superbly. Crisp cold air, rural backroads, sunrise, and an excellent machine. This was the stuff of TV commercials. There was a stint of about 12 miles on a two lane highway where the R50 hummed along at 60 like it could go on forever. If my grin was any wider, I would have swallowed my ears. At every light, the bike returned to idle perfectly, and after 35 miles I arrived at the start point and left it running while I got fuel. Then I pulled up alongside the other bikes present, and reluctantly shut it off for the first time since my garage. The event was the 4th Annual Fall Vintage Ride and BBQ organized by Todd Trumbore. Todd organized the Guinness World Record attempt earlier in the spring and is a general dynamo of the vintage motorcycle community in this area. Todd should be classified as an alternative form of energy by the department of energy. If we could somehow harness the energy and enthusiasm that he exudes at every event, we could probably power the northeast this winter. But I digest...It turns out that I was the lone BMW /2 on the ride at the start (another joined later). There were plenty of /5/6/7 bikes, and some Triumphs and a few Harleys, a Yamaha, and a Guzzi. All cool stuff. Todd came over to inform me that the 50 mile loop was nixed, and we would all stick together on the 100 mile loop ! All righty then. I warmed up with coffee, and had a fun conversation with Horst Oberst. It turns out that he used to race an R50, and I asked him how to get the most out of the machine on the ride. He responded in his inimitable accent that I should hang off more and get my knee down. A while later we got the signal to mount up. I looked at the bottom of the carbs and they were both moist. That problem is better, but obviously not completely resolved. Those with tempermental bikes and those needing special assistance were invited to begin their rituals early. Bikes roared to life and I hoped that mine would as well. First kick, nothing... But wait, there was a slight vibration in the bars. It turns out that it started first kick, and I was unable to hear or feel the smoother idle over the noise and thunder of everything around ! We were off. momentum is keyTwenty-seven horsepower is not a lot of power compared to, well, anything. 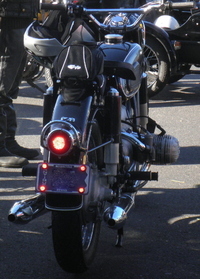 The BMW R50 does not dart or thrust or zoom, or use any advertising term associated with performance. It builds to a plateau of steady progress in a locomotive sort of way. It also does not stop on a dime or throw out anchors, or use any advertising term associated with braking performance. It retards progress at a steady pace in the same way that land masses retard the progress of hurricanes. Riding in a group of more modern equipment requires an understanding group, keen anticipation of impending events, and a mastery of momentum. I was with a great group and, fortunately, I grew up riding Honda 50 Cubs and other machinery that could only dream about 27 horsepower. The skills honed in those days served me well on this day. The bike performed admirably, and I am sure that I had close to all 27 horses working as a team. In fact, I came close to grinding the valve covers a couple of times. Horst would be proud. At the gas stop all was well, and temperatures remained very cool. Several people liked the idea of a magnetic tank bag as tail bag. Magnificent roads and fall leaves beginning to turn made for a beautiful second half of the ride. Starting from a dead stop was a challenge, but only because I wanted to avoid holding up those behind in the formation. The bike seemed to be running even better and shifting was less ponderous. Finally, we arrived at the park where the ride concluded without a mechanical failure in the group (although with a few hindrances). There is a sort of celebration in the air when a vintage ride concludes that approaches what riders must feel at the end of the Dakar Rally. More than a few are just happy to have made it without issue, and have a mixture of pride, relief, and astonishment. Others have overcome brushes with misfortune and harrowing moments unbeknownst to others where life and limb were at risk. Still others dismount just satisfied with a good day's riding. The outcome was never really in doubt, and the new tires/grips/fill-in-the-blank worked fine. We grabbed some grub and told lies, but with vintage iron, the truth is usually more entertaining. The event wound down. First kick, perfect purr. I headed home and even added a few miles as confidence was now just overflowing. Back in the garage, I studied the R50 with renewed admiration. It is one thing to hear people talk about how sturdy vintage iron can be, but it is quite another to take a 45 year old machine with a somewhat unknown history, bring it back to operating condition, and then rely on it in what amounts to a high performance situation. This was not a leisurely day of 35 -50 MPH meandering. 175 miles does not sound like a lot, but on this day, it was a long stint at the vintage proving grounds.